On March 1st, I entered into the world of motherhood. At 2:16 a.m. Kingsley Joy North made her appearance for the very first time. The second my 7 lb baby girl was placed on my chest, I knew my life would never be the same. The months leading up to her birth were filled with nausea, heartburn, ever-fluctuating emotions, hard conversations, and 9 p.m. bedtimes. Between my 12 hour shifts as a mental health nurse at the hospital and Josh’s job as a pizza delivery driver, I spent the majority of my time either working or sitting on the couch at home by myself. In the midst of the loneliness and exhaustion, God gave me a word that I adopted as my anthem for both pregnancy and motherhood. The word? Grace. Now I am very familiar with the verse in 2 Corinthians that states: “My grace is sufficient for you, for my power is made perfect in weakness.” However, I had never before leaned into God’s grace the way I did after I found out I was pregnant. Not only did I have to trust that God had enough grace for me in the difficult moments, God also challenged me to extend grace to myself. I was no longer allowed to beat myself up for watching an entire season of Heartland on Netflix instead of cleaning the bathroom. I wasn’t to feel guilty for indulging in the occasional Snickers bar at work (let’s be honest – it was more than occasional), but was instead to do my best to eat a balanced diet. I leaned into God’s grace more and more as my patience grew shorter and shorter during long shifts at work and I needed His strength to not melt into a puddle of tears. As I said yes to grace, the Lord began working in me to let go of the checklist of behaviors I had created and instead let myself off the hook. I realized He would not love me any less if my to-do list remained incomplete, if I ate a Snickers bar a day, or if I cried at work. He also began to teach me the value of self-care and listening to my body. The most significant lesson (one that I am still learning) was to be okay with asking for and receiving help. I am learning that it’s okay to not have it all together and to allow community to meet needs that would otherwise go unmet. All of these lessons have continued into motherhood. I am 7 weeks in and my days still consist mostly of sleeping, changing diapers, feeding Kingsley, and watching Netflix. I do the occasional load of laundry and sink full of dishes. If I am super ambitious or full of energy, I sweep the floors and clean the bathroom. I consider going on a weekly walk to be a major victory. But some of my biggest accomplishments over the past few weeks? Admitting to a close friend that we had only one newborn outfit for Kingsley when she was born and receiving a bag full of sweet little sleepers so my baby wouldn’t be naked for her first month of life. Allowing my friend and mentor to bring me lunch instead of touting my usual “thanks, but I’m fine” when she asked if that’s something I would like. Letting my cousin scrub my bathtub, a job that I hate and that gets done far less often than I care to admit. I have learned to ask for and receive help with grace. As I reflect on the past few months, I can truly say that God has indeed met me with His presence in the moments when I least expected it. One day soon after Kingsley was born and Josh had returned to work, I experienced my first poop explosion. It resulted in me having to bathe Kingsley by myself, something I had never done, as well as having to change my own clothes. By the time we were both clean, my poor baby was traumatized and just needed snuggles. I popped her in my lifesaving baby carrier, where she promptly fell asleep. Since it was the first time my arms had been free for two weeks, I decided to fold a load of laundry. As I was folding little sleepers and burp rags, the song “So Much Grace” by Jonathan Helser flooded my mind. I began singing the verse “there’s so much grace” over and over again. As I sang, the Lord overwhelmed me with His presence and I began to cry. I sat in the rocking chair in the nursery and sang and cried and poured my longings for Kingsley and our family out before my precious Lord. I felt so blessed that my Father would meet me in the midst of such a mundane task and affirm who I am as His daughter and as Kingsley’s mother. His grace truly was enough for me. Whatever you need grace for in this season, know that God will supply it in abundance, perhaps in ways and places and through people that you would never expect. Say yes to grace and watch and see what He does. In all of my years of blogging, I have never missed posting on October 1st. I adore the month of October, so no matter how sporadic I’ve been at posting throughout the year, I always make a point of putting pen to paper (or fingers to keyboard) on that beautiful day. 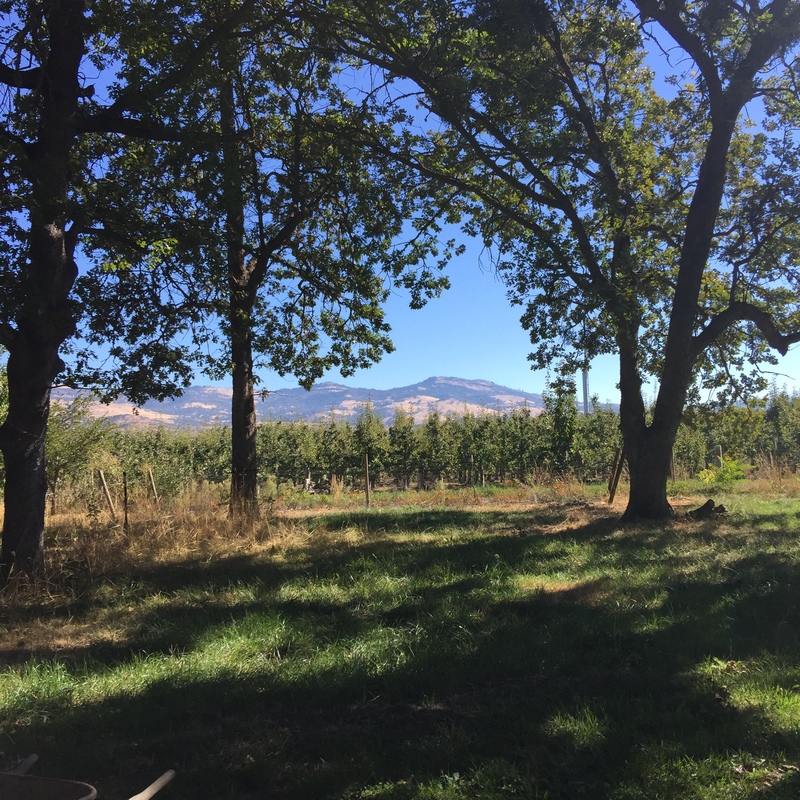 This year, I was on a women’s retreat in Ashland, Oregon on October 1st. So I let myself off the hook and simply enjoyed the day. I did celebrate by drinking my first pumpkin latte of the year, which happened to be the best one I’ve ever had. I’m not generally a pumpkin latte fan, so I was quite surprised. I only tried it because I trust the coffee shop immensely (shout out to Case Coffee Roasters in Ashland) and they advertised it as having organic pumpkin and brown sugar something-or-other – so of course I was sold. As usual, Case didn’t disappoint! Good coffee was only one small part of this life-changing weekend. As some of you know, this year has been one of the hardest of my life. For many different reasons, I’ve spent much of the year crying, hiding from people, and questioning God’s call on my life. At the end of the summer, I began making conscious decisions to stop the pity party that has been 2016 and begin taking steps toward creating community and positioning myself to once again hear God’s voice. As a result of that decision, I found myself enrolled in a nine month program at my church called Emerge. The goal of Emerge is to develop leaders through reading specific books, completing strategic tasks, and engaging in weekly one-on-one mentoring. At the beginning of the course, the women’s retreat was listed as mandatory for all of the women in Emerge. It ended up not being a requirement, but I had already taken the weekend off of work and figured that I would be a “good student” and go on the retreat. I honestly had no desire to go – I didn’t know anyone and ended up riding there and sharing a room with complete strangers – something miles outside of my comfort zone, which has grown smaller by the month. Little did I know that my tiny of act of courage had actually positioned me to receive things from God that I didn’t even know I needed. The first clue that this retreat was exactly what I needed was the theme: Refresh. Let me tell you – after the year I’ve had, that sounded so good! The first night, the speaker talked about the woman in Luke 8 who was healed by Jesus after 12 years of chronic bleeding. She talked about the language Jesus used when speaking with the woman in verse 48: “And he said to her, “Daughter, your faith has made you well; go in peace.” It was so interesting that she spoke about this particular thing, since I’ve been struggling a lot with what it looks like to be God’s daughter. I realized, maybe for the first time, that God actually wants to be bothered with me. He is not intimidated by my messiness or my stubbornness or my desperation – He actually wants to meet me in the midst of it and calls me daughter. That was only the beginning. About a week ago as I was cooking dinner, I was so desperate to feel God’s presence and His love for me that I prayed this prayer, “God, I don’t know if I’m allowed to pray this, but please give me tangible evidence that I’m on Your mind.” God brought that desperate prayer to mind on Saturday in the midst of a three day span during which I genuinely and tangibly felt God’s love for me. On Saturday we had some free time and when we all came back for dinner, three women whom I had just met the day before who were sitting at my assigned table presented me with a gift: a maternity shirt that says “Promoted to Mommy.” Maybe it seems like a small thing, but it spoke volumes to me. In the nearly 5 months that I’ve been pregnant, I’ve felt very alone – far away from family and the people who are “supposed” to be the most supportive during times like this. I realized that in between throwing up and trying not to throw up, I hadn’t really celebrated this new little life or invited others to celebrate with me. It was so encouraging to be surrounded by women who have been where I am and who are celebrating me as I embark on this new journey of motherhood. Saturday evening, after yet another powerful message during which I cried for about the sixth time in two days, that night’s speaker looked me directly in the eyes and said “There are some of you here who feel unseen. I want you to know that God sees you. One of His names is “El Roi, the God who sees.” I was done. God had heard that desperate cry spoken through tears from my kitchen in Shasta Lake, California. He had heard me and He had answered. For the first time in at least a year, I could feel God’s presence and His eyes on me. This truth rang in my ears: God sees me! I wasn’t alone. On September 30th, I stepped out in obedience and went on a women’s retreat. It was a little step. And God was faithful to meet me. As Amy Bailey, one of the speakers said “God meets us in the beyond with the fullness of Himself.” I went beyond my comfort zone, and God was there. The verse that was prophetically written in the journal I received this weekend was Jeremiah 29:13: “You will seek Me and find Me when you seek and search for me with all your heart.” It’s true! I’m still the same person I was before I went to Ashland. I don’t have a crazy story of transformation. What I do have is a story of desperate obedience and the truth that God met me in the beyond with the fullness of Himself. The six months that have passed since my last post have been full of travel, big life changes, and – most recently – lots of time spent on the couch trying to not succumb to morning (or all day) sickness. That’s right – we’re having a baby! We found out the end of June, and oh boy has it already been an adventure! On March 27th I turned 27, so Josh planned a trip to Napa/Sonoma to celebrate. We had an amazing time exploring, sipping new wines, and enjoying delicious pastries at our quaint B&B. It was definitely one of my best birthdays to date – and the company wasn’t bad either! In April, we traveled to NY/NJ area for our dear friends Jon and Catherine, who asked both of us to stand up with them on their wedding day! We had a blast eating good food, visiting family, and catching up with friends. We realized that was the longest vacation we have ever taken together and decided it must not be the last! Weekend getaways are fun, but there is something to be said for taking a substantial amount of time off to simply explore, eat good food, and reconnect with the people we love. Only a few weeks after returning from New York, we headed down to Oakland to watch the Yankees play the Oakland A’s. I bought the tickets for Josh’s birthday back in February, so it was fun to finally go! At the game, we found out that if we took our tickets from the game to the Greek festival in Oakland, we could get in for free. After the Yankees won, we found the Greek festival and enjoyed a tour of the Greek Orthodox Church, festive dancing, and incredible food. Reunited with our favorite pizza in Nyack, NY! Our lovely friend Colleen – we of course had to visit the Chocolate Room in Brooklyn! Ruth gave us a tour of Williamsburg – who knew we were missing out on Mast Chocolate? Our baby announcement – we’re going to be parents! When Josh and I made the move to California and settled into a new life rhythm, we decided that monthly getaways needed to be a regular part of that rhythm. Praise the Lord that I married a man who recognizes that discovering new places and traveling keep my heart alive and should be a given in our budget. Since moving to California we have visited Yosemite National Park, Ashland, Oregon, San Francisco, and Las Vegas, Nevada. This past weekend, we decided this month’s getaway would be to Sacramento – about a 2.5 hour drive. We have been down there a couple of times, but never for more than a quick visit to Old Sac or to fly in and out of the airport. I’m fairly certain this is the first trip we planned entirely around food. One of the restaurants we wish we had access to on a regular basis is Chick-fil-A. I worked at one in high school and it is definitely still one of my favorites. I introduced Josh to their chicken biscuits about a year ago, so now we make a point to start our adventures with them as often as possible. After breakfast, we made our way to a local mall and a couple of outdoor shopping plazas in Roseville. We enjoyed wandering in and out of stores that we frequented while living in New York, including our favorite kitchen store. When we had our fill of window shopping, we headed to our hotel near downtown Sac, where we enjoyed a dip in the hot tub. For dinner, we chose a new favorite – a brewhouse we were first introduced to by friends in Las Vegas. Their pizza cookies are a favorite of ours – especially the peanut butter s’mores. It’s safe to say that we consumed far more calories than necessary, but we certainly enjoyed every bite! On Sunday we visited the hot tub one more time and enjoyed a delicious continental breakfast before starting our journey home. But of course we could not venture back to Shasta Lake without first visiting a local coffee shop. Of course we had to try out the pastries with our cappuccinos. The almond croissant was incredible! So needless to say, our trips usually revolve around food (specifically pastries) and good coffee. I would say we’ve discovered quite a few new favorites in less than a year in the area. I can’t wait for our next adventure! A couple of days ago as I was driving to work, I passed a house that had a little plastic nativity in the front yard. As I peered out my window into the dreary gray morning, I became indignant. What I saw were Joseph, Mary, and Jesus all sitting together in overgrown, dead grass, surrounded by weeds. I began to criticize the house owners in my mind, thinking that the least they could have done was prepare a decent space for our precious Savior and His earthly parents. I could barely get the thought out before the Lord gently prompted me with another, less critical way of looking at the messy little lawn. The thought that followed was this: Jesus does not ask us to clean up our messiness before we invite Him in. Yes, there is something to be said for preparing a space for the Lord, which is the entire point of the Advent season. However, Jesus came to Earth because of our messiness, because of our inability to clean ourselves up on our own, because of our unworthiness to create a space fit for a King. No matter how often we water the grass or pull the weeds, Jesus has no problem with sitting in the midst of the mess with us. He will walk straight into the brown dead grass, lift up our heads, and bless us with love and truth. I now have a great respect for my neighbors down the street. The very decorations in their front lawn declare their belief in the Christmas story. They weren’t going to let a little dead grass get in the way of their celebration of Jesus. What are the weeds in your life that have kept you from inviting Jesus into the mess?